Earlier this year I was contacted by one of the young ladies at church to see if I would help her with her wedding day by embroidering hankies for the bridal party and close family. After discussing font size, layout, types of hankies, colours & threads I agreed to the order. It took awhile to settle on how to prepare the hankies. I prefer to trace embroidery designs using pigma pens but knew they would be too thick for this job. Checking in with some friends, I settled on using a fine graphite led pencil. 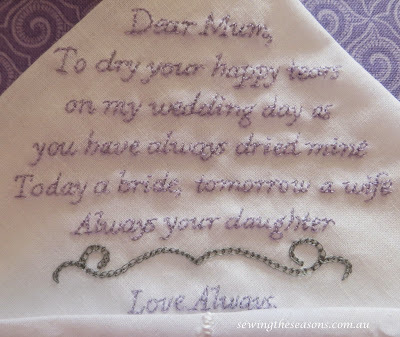 To prepare the hankies, I carefully lifted where the bride to be had placed the message then I ironed a piece of freezer paper to the back of the hankie before sticking the message back in place. Using freezer paper is ideal to provide stability for the fabric when tracing, especially when it's a fine fabric. Once under way, we needed to regroup, two strands of embroidery thread were too thick for this delicate project. then trying one strand only, the threads were twisting, knotting and fluffing up and I was just not happy with the finished look. 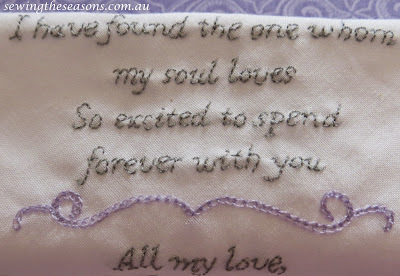 The bride to be and I met, discussed, considered alternatives and I had a brainwave - I tried my machine embroidery thread but using it by hand - success! So after many days and nights of work, I was able to let the bride know the hankies were done. 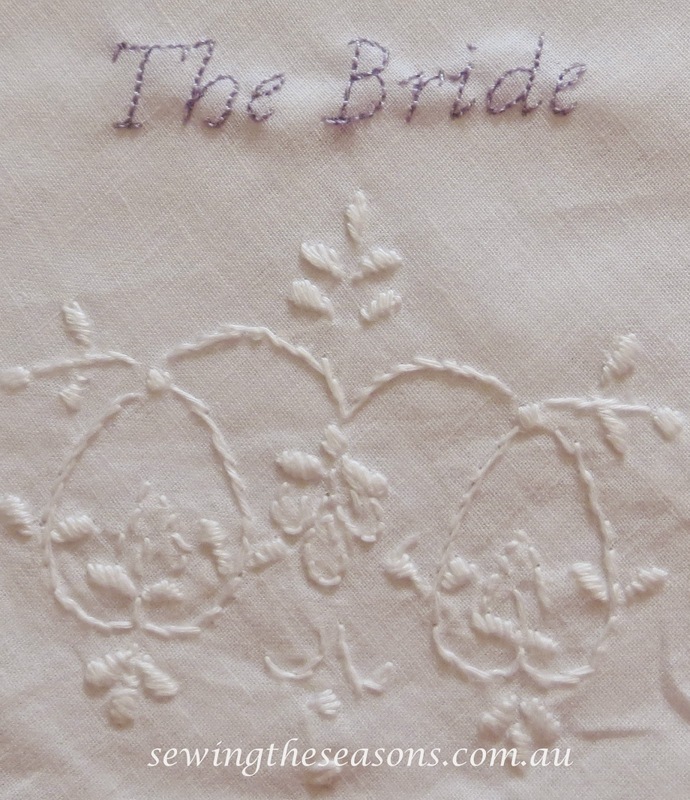 I decided not to press the finished hankies, to allow her to decide how she wanted to press and then present them as her gifts to the bridal party and her family. These photos show just some of the hankies and part of the messages. 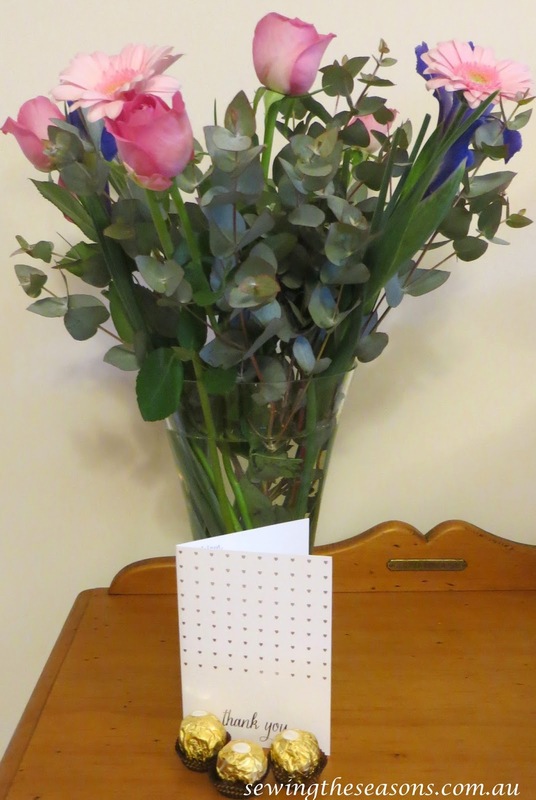 I was touched too that when the bride to be came to pay and pick up her hankies, she presented me with a gorgeous bunch of flowers, some choccies and a thoughtfully written thank you card. Beautiful work to treasure for ever.